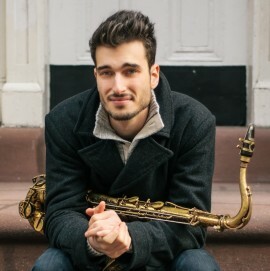 Chad Lefkowitz-Brown is a GRAMMY winning saxophonist known for his work in the jazz and pop genres. He has made television appearances with Taylor Swift and Phillip Phillips, and has toured on four continents with many esteemed jazz artists. Throughout his teenage years, Chad developed a local following. He began playing throughout his community at clubs, theaters and festivals, and led benefit concerts for local and national homeless shelters and cancer societies. Among the numerous collegiate programs that sought Chad’s scholarship, he continued his education in the arts at the Brubeck Fellowship Program, a prestigious program started by jazz legend Dave Brubeck, in California. Just four years after graduating from the Brubeck Institute, Chad has already performed across the globe, and has appeared at venues including Carnegie Hall, the Super Bowl, and the GRAMMY awards. He currently tours and records as a sideman with many renowned bandleaders including Ron McClure, Clarence Penn, the Metta Quintet, Amina Figorova, and Arturo O’Farrill’s GRAMMY winning Afro Latin Jazz Orchestra. In 2014, Chad was the featured soloist on the title track of “Offense of the Drum” an album that went on to win a GRAMMY award in February, 2015 for Best Latin Jazz Album. Chad has appeared in concert with pop icons Taylor Swift, Phillip Phillips and Josh Groban, and he formerly toured as the musical director and saxophonist for R&B singer, Alice Tan Ridley. Chad endorses Lupifaro Saxophones, Navarro Saxophone Mouthpieces, Silverstein Ligatures, and Lupifaro Reeds. Chad plays a Lupifaro Platinum model tenor saxophone, Lupifaro Classic 2 reeds, and a Navarro Marble Hard Rubber Bahia 8.